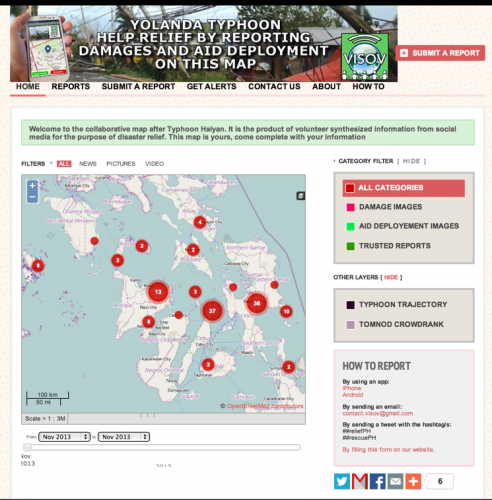 This week, we recognise the efforts of the team at Volontaires internationaux en soutien aux opérations virtuelles (VISOV), who are crowdsourcing images of destruction and aid deployment in the wake of the Typhoon Yolanda in Philippines. This deployment, much like all other efforts being ran out there, will go a long way in helping to alleviate the suffering of the Filipino people. We've also seen some google crisis maps and google person finder deployments as well. Early results of the Micromappers response can also be found here. Even as we figure out what ways to help as digital humanitarians, we need to draw lessons to improve on disaster response. Andrej Verity wrote an excellent piece on how emergency response can change within the next few years, and what role technology plays in this transformation. Read it here. The European Journalism Centre just launched a dedicated website for the Verification Handbook, a groundbreaking new resource for journalists and aid providers, offering step-by-step guidelines on how to deal with user-generated content (UGC) during emergencies. The initiative is supported by the Dutch Ministry, the African Media Initiative, UNHCR, UNDP and UNAOC to name a few. This free-of-charge handbook will be released on Tuesday, 28 January 2014. Today, the Making All Voices Count team launched the Global Innovation Competition! In just a few days, hundreds of crisis mappers will convene in Nairobi for the 5th Annual International Conference for Crisis Mappers. Hoping you can join in on the pre-conference training day on the 19th of November! Translators without borders are looking for a kenya based project manager. A detailed job description is available here. FrontlineSMS also have a bunch of job and internship openings. Have a look! Here's an update on what the v3 team has been working on in the lead up to the beta release in a few weeks. Robbie has been wiring up the post edit UI, which turned out to be a fairly length task. There are still a number of glitches that he needs to fix before merging in. As we continue to build out 3.0, everyone contributing will need to sign contributor license agreements. They are being drawn up, based on Apache CLAs. Here's a look at the individual one, and more info on our wiki page on licenses. More documentation is also being made available, in particular, revolving around release processes. Update install instructions with all the awesome feedback we've gotten. If you missed out on the v3 Nairobi meet up, here's a run down of how it went, as well as the community demo discussion. Did you miss our API walkthrough with Evan and David? Not to fret, we recorded it :). For tips on what steps to take in order to build an app on our extensive API, have a look. API documentation is available here. We'd be happy to hear about hear about app ideas, so feel free to get in touch with us! Added ability to configure different format for the sync scheme. Added Basic HTTP Auth to Sync URL. Fixed issue with task check not working when there is no secret key set. Fixed a lot of internal bugs. You can head over to the App Store and take it for a spin. Rock on!